Arguably the top sativa strain available today. 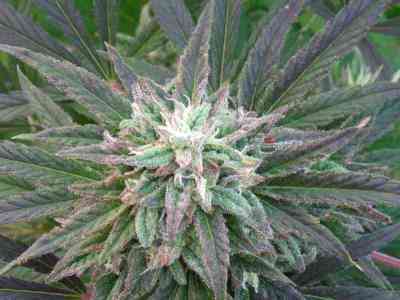 With 90% sativa genetices, Kali Mist grows into tall, classically sativa plants with very few leaves. This strain produces dense clusters of full fluffy buds, producing much higher yields than you would expect. The plant structure and few leaves allow the light to pass all the way to lower branches, allowing bottom buds to develop fully. When planted outside early in the year this plant can grow very tall. Expect spiraling flowers with a high resin content and a delightfully spicy scent. Kali Mist is often the choice of experts for their own stash grows. Also, women particularly seem to like this strain, next to the sheer pleasure of smoking it, we received several reports that it works great against menstrual cramps. We are proud to announce that Kali Mist was improved in 2000 to produce bigger yields. In Spain it proved to be very mold resistent, even outside during bad weather. This strain has flavor and subtle cerebral effect that gave it a Cannabis Cup first prize in 1995 (Hydro Cup) and again (with this new and improved version) in 2000 (Seed Company Sativa Cup)! Without a doubt the choice for connoisseur stash. Gives a very strong, clear and energizing high.